Proposition: things are located in places, but places are not made of things. To students working onsite, it is often useful to think a little less about looking at things than trying to see through them. At heart this advice gets at questions of place. Places reveal themselves in layers. Here are two sets of illustrations, the first of which are all from Cosmopolitan, that create interest through a use of layers. First, a Robert Weaver depicting a man fleeing through a city park at dusk. (1962.) A row of orange buildings suggests the sunset which must have recently passed. The rising moon is untouched by color, a wink at a third moment in time. The trees in the foreground dominate the picture, even as we look immediately through/past them to gather the information we need to decipher the image. Take the trees out, and the image loses much of its force. At right, a second Weaver (1958). Here he uses a reflection on a storefront window to provide information about what's across the street, even as a shadowy scene takes place behind it at left. The monochrome color provides tonal levels and atmosphere. Next a Bob Peak image (also 1958) describing a stakeout of some sort. The sense of inside and outside are strongly established through the use of color and value to create transparent scrims. Next, a companion set of images from Miroslav Sasek's This is ______ (fill in the blank) series of books for young people, originally published in the late 1950s and early 1960s, recently reissued. Sasek has a tremendous eye for the telling view, and a sense for what made each of the cities he described particularly themselves. Of particular interest to me is the way he combines reportage with an abstract sensibility. Wonderment. Robert Weaver, Man fleeing at dusk, Cosmopolitan, 1962. Robert Weaver, Advocate, Cosmopolitan, 1958. Bob Peak, Stakeout, Cosmopolitan, 1958. 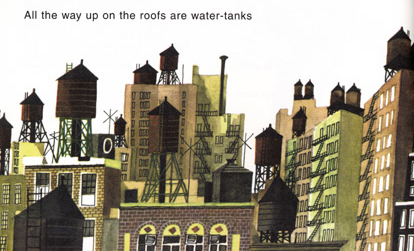 Miroslav Sasek, This is New York. Miroslav Sasek, This is San Fransisco. Miroslav Sasek, This is London.